For this grilled chicken, a little smoked paprika, chili powder, butter, and salt and pepper are all it takes to make a sensational dinner. Crisp and insanely flavorful skin. Tender, juicy meat. As most of you who are mavens at grilling know, there tends to be a little guesswork involved while standing at the grill. Or let us put it another way. As most of you who are novices at grilling know, there tends to be a little guesswork involved while standing at the grill. This recipe relies on covered grilling, which dispels a lot of the guesswork in terms of how high a flame and how long to leave something over the flame by essentially turning your grill into an oven. As such, a steady temperature can be maintained even on a grill. And yes, this recipe for grilled roasted chicken offers actual specific temperatures and times that you can easily approximate. How easy is that?! 1. Combine the paprika, chili powder, salt, and pepper in a small bowl. Rub the mixture inside and outside the chicken, both over and under the skin. (Be careful not to tear the skin.) Let the chicken sit at room temperature for 30 minutes. 2. Prepare the grill for indirect cooking, making a hot fire on half the grill and leaving the other half unheated. Place an inexpensive oven thermometer (available at any kitchen supply store) on the cool half of the cooking grate. (You can’t rely on your grill’s built-in thermometer because you want to measure the temperature only on the unheated side. ) Close the grill and heat the temperature to 400°F (200°C) on the unheated side. 3. Using washable heatproof oven mitts, place the chicken, breast side down, on the unheated side of the cooking grate. (If you have a low-powered gas grill that won’t reach the ideal 400°F (200°C) roasting temperature, you can still grill-bake your chicken in standard oven fashion, increasing the cooking time as needed until the chicken is cooked through.) After 35 minutes, turn the chicken breast side up. If a glossy skin is desired, brush the bird with a tablespoon or more of butter. 4. Reduce the heat to 350°F (175°C). If using a gas grill, simply turn the heat down; if using a charcoal grill, close the vents and spread out the charcoal. Cook the chicken until the skin is crisp and well-browned and an instant-read thermometer stuck in the thickest part of a thigh reads 170° to 175°F (76° to 79°C). Let the chicken rest for 5 to 10 minutes on a cutting board. Carve and serve. 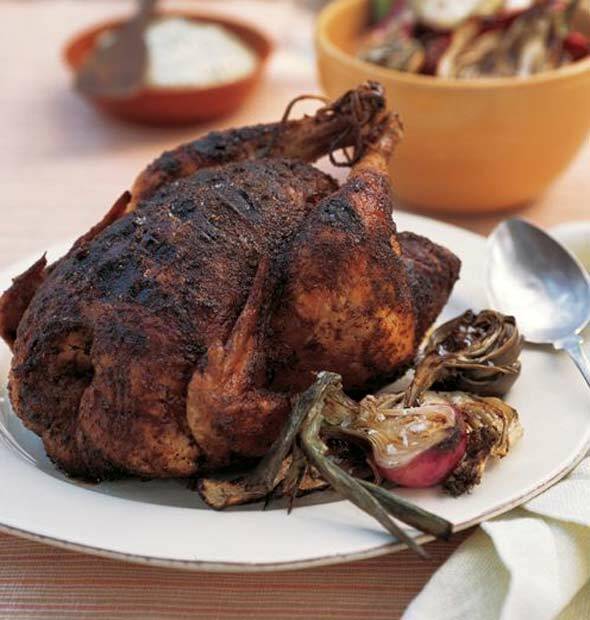 This grilled-roasted chicken was simple to prepare and everyone enjoyed it. I definitely will add it to my recipe file and make it again. It is a wonderful chicken recipe for outdoor entertaining and also it is a good weekday meal as well and any leftovers are great for lunch the next day. This is an excellent grilled-roasted chicken recipe. Rubbing the spices under the skin in addition to putting them on and in the chicken added an extra zip to the recipe. The chicken cooked up juicy and flavourful with a very nice, crispy skin. This was a quick, simple roasted chicken recipe to put together with tasty results. The ingredients for the rub are spice-rack staples, no need to rush out to the store for extra ingredients. The chili powder gave a little bit of bite that gives this recipe a different taste than most other grilled chicken recipes. The indirect grilling produced moist chicken with a crisp skin. 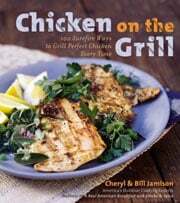 Grilled Roasted Chicken Recipe © 2004 Cheryl and Bill Jamison. Photo © 2004 Ellen Silverman. All rights reserved. All recipes and photos used with permission of the publisher. I’ve roasted many a chicken but this was the BEST ever! The rub gave it great flavor without being overpowering, the skin was crisp and the meat was moist. Used my gas grill and it was nice not to have to worry about smoking/burning cicken! Love this, Mary! So glad to hear it!